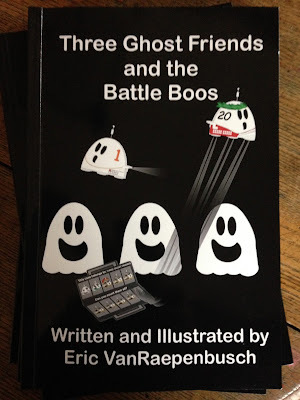 Eric VanRaepenbusch, Author-Illustrator, Storyteller, Blogger: THREE GHOST FRIENDS AND THE BATTLE BOOS - COMING SOON! THREE GHOST FRIENDS AND THE BATTLE BOOS - COMING SOON! Proof copies of my next book, THREE GHOST FRIENDS AND THE BATTLE BOOS arrived yesterday. I am so excited to share the book with you. It won't be long. Hang tight! After long time later today i receive a fantastic blog. Now i am feeling awesome. Because after reading your whole information now i get more info. I want to write some content for my website. Now i am finding essay-on-time.com review for my personal writing assistant. Thank you so much for your great blog.